Immigrants from all over the world are continuing to move to Illinois in large numbers. As they settle into an increasingly diverse range of communities within metropolitan Chicago, this expansion of ports of entry creates new challenges for the state and local communities in assessing and meeting their needs. -- Where are immigrants in northeastern Illinois moving and how does the migration pattern today differ from previous trends? -- How many immigrants are in need of English to Speakers of Other Languages (ESOL) instruction? Where do these immigrants reside? -- What barriers can be identified that prevent or make it difficult for immigrants to learn English? -- What are the employment patterns of immigrants that might affect their ability to have time or access to Speakers of Other Languages (ESOL)? Methodology: CIR analyzed demographic data, primarily to establish the communities in northeastern Illinois that needed to be targeted for further investigation. Material consisted of Census data from 1990 and 2000, Current Population Surveys from 1994-1998, as well as information from academics, demographers, and community leaders who were able to provide more accurate and up-to-date information about immigration patterns and trends. 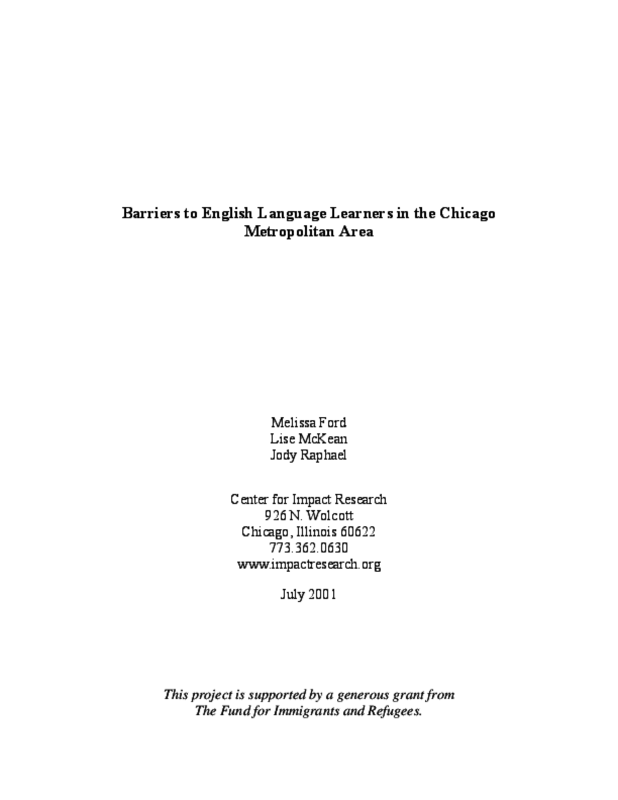 To determine experiences with, and barriers to ESOL instruction, CIR conducted 76 interviews with immigrant service organizations and ESOL providers in the Chicago metropolitan area. In addition, CIR conducted 37 interviews with Mexican and Polish immigrants throughout the region and with Chinese immigrants in Chicago to confirm or validate information from social service providers and to further identify barriers and issues around ESOL instruction. Lastly, McHenry County College, at our request, administered a written survey in Spanish to 200 immigrants in ESOL classes at the college. This report presents the findings from this research. As ESOL providers work to meet the needs of their students while maintaining the integrity and professionalism of their instruction, the thoughts and opinions of ESOL students and other immigrants in the Chicago metropolitan area enrich the discussion of issues under consideration by policy makers, funders, and ESOL learning centers.